What is it about a will that makes so many people procrastinate writing one? Is it too complicated or do they think they need a lawyer? Or is it that discussing details about death makes people nervous? I believe most people put off their will for all of these reasons. But for me, these are not the reasons I have not written a will. I just did not set aside time with my husband to get it done. I started thinking about writing a will a very, very long time ago. I did get more serious last year when I started my blog, but then one thing after another made me push it aside. Based on the popularity of my post titled “Preparing to Write a Will,” I’m guessing that many other people have put off writing their own wills as well. That post has been visited over 5,000 times and pinned 5,200 times since last July. I guess that, for me, it wasn’t enough to research and share about writing a will. It didn’t get me anywhere in terms of my own will. That’s why I’m writing this post. I have an idea that might make this task less miserable and morbid. Possibly even fun! One of my goals at the beginning of 2015 was to set aside two nights a month for date night. We did great at the beginning of the year and then let things slide as the months went on. For one of the date nights, I really wanted to get this will done. I even bought all the food that I was planning on making for that night. But for some reason it just never happened. So I think coming up with a plan got us closer to the task of writing a will, but obviously not close enough. I really should have set a date to talk about our will. I kept saying we were going to do it, but I never once wrote it on the calendar. If you want to successfully get your will done, make sure to pencil (or enter) the date into your calendar, and then get planning. Before you get to the boring stuff, start your date night on the right foot (or end with the fun stuff, whatever motivates you more). Here are several fun ideas to help you complete that will sooner rather than later! Take turns talking about your wishes for a happy and fun funeral. Only write down the details if you truly want your funeral to be that way. Write a couple’s bucket list of things you’d like to do as a couple before you die. Just the other night, my husband and I finally put pen to paper and wrote out some details for our will. We discussed what we wanted for our funeral (if we were to die together) and ended up laughing and having a good time. We decided on who we would want to be our daughters’ guardian, and called them up to ask if they could do it. We don’t have a complete will yet, but it’s a start! When you do your will planning date night, be sure you are ready to discuss the topic. Here is a list of resources that can help you when the time comes. Make sure you understand what the purpose of a will is before you write it. 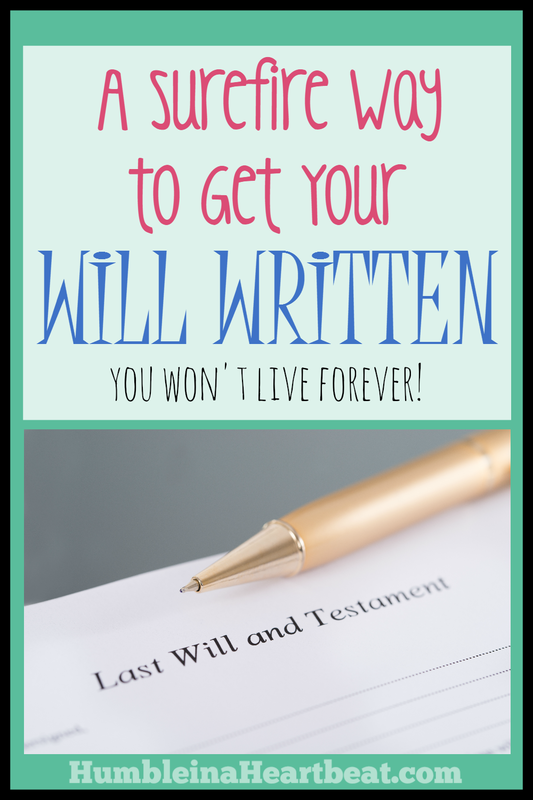 Print out a list of things you need for your will before you sit down to talk about it. Find out what to include in a letter to your child’s guardian in the event you both passed away. Find an online free service to complete it. Be sure to check with your own state about whether or not you need a lawyer before you do this. Spend some time putting together the 25 documents you need before death. Writing a will is super important for your family to be prepared in a worst case scenario. Precious lives can be taken in an instant and you never know when it could happen. Do your best to set aside time to write your own will, even if you use a free online service. It is much better to have a will prepared and written by you than to be without one in the event that something terrible happens. Do you have an idea that would motivate you to write your will? Disclaimer: This post is informational only. I am not a lawyer and cannot offer legal advice. Please direct any personal and specific questions to an attorney. Great tips. None of us knows the day or hour of our death, but we can be %100 sure that it’s coming. We felt a lot better after we prepared a will a couple of years ago. The online services make it so easy to do a basic will, and for a great price. Thanks, Janeen! Do you remember what service you used to do yours? I have seen a few that offer free trials and I might go that way and then cancel before the trial is up. We used legal zoom. Easy, peasy. Oh man I love your humor with the food and movies! Yes it should totally be a date night! I don’t have a will either, though we have our finances in order regarding our major assets. Still, I could probably do a whole lot better with that! Why make it more boring than it already is, you know? 🙂 Once we have it done, I know I’ll feel better knowing that if we do happen to die at the same time our girls will be in good hands. That’s awesome it can be done for free. I used the legal zoom for my will and it was really simple. I really appreciate your efforts for writing this post. I think this is worth reading the post. I think it is never too early to start planning. We are not promised tomorrow, so if we want to ensure that our last wishes for our assets are fulfilled, we need to take the time to write the proper documents. This year has been one of Death by Concert, Death by shopping and even Death by attending church service. Truly, we so not know the day or hour, but death will come. With a Will, POA and perhaps a DNR in place we save our family and friends distress in their sorrow. Your post is appreciated.